Large data center leaf-and-spine fabrics often use BGP to propagate endpoint reachability information (using IPv4, IPv6 or EVPN address family), or to replace IGP. In both cases, you have to decide whether to use IBGP or EBGP within the fabric, and whether to use one or multiple AS numbers on the leaf layer and the spine layer. 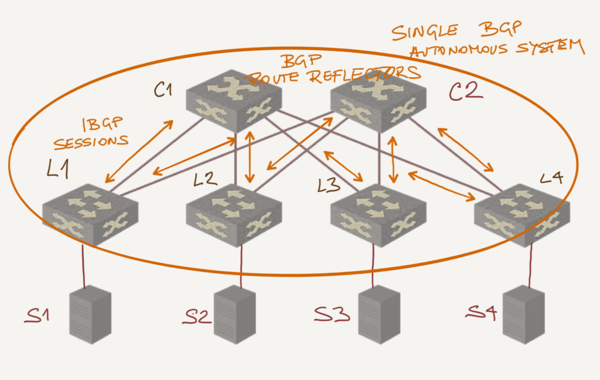 Should we use BGP as a routing protocol within a data center fabric? Should we use IBGP or EBGP within the leaf-and-spine fabric? Should we use the same AS number on all spine switches? Should we use the same AS number on all leaf switches, or should each leaf switch have a unique AS number? Should leaf switches in an MLAG cluster use the same AS number, or should they have a unique AS number? What’s the impact of AS numbering on EVPN and MPLS/VPN services? Extensive feedback from Dinesh Dutt and Nicola Modena made this document significantly better. Thank you! The rest of the document assumes reasonable familiarity with BGP concepts (for example, the details of next-hop handling in BGP or the difference between IBGP and EBGP). Use OSPF or IS-IS as the fabric routing protocol. Use BGP only when needed, for example to run EVPN control plane. Want to master data center technologies and architectures, including compute, storage, and network services? Check out the Building Next-Generation Data Center online course.